In 2013 Katherine graduated from a Bachelor of Natural Science (Agriculture) in a class of just three students. Now she’s telling her story in the hopes of inspiring other young people to get involved with agriculture. And like a lot of young ag enthusiasts, her love really started with her school’s show cattle team…. My name is Katherine and I am an agvocate. 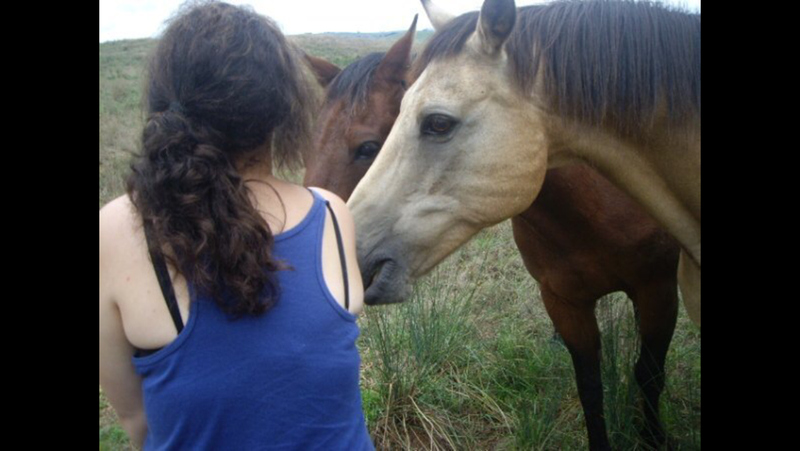 From a very young age I remember being immersed in the country lifestyle. Without a doubt, time on my uncle’s Southern Highlands property ‘Clydesdale’ played a large role in my enthusiasm for agriculture today, but there has been 21 years of adventures between then and now. Sydney’s western suburbs aren’t the typical place you would go looking for a young girl interested in agriculture but that was where you would have found me. 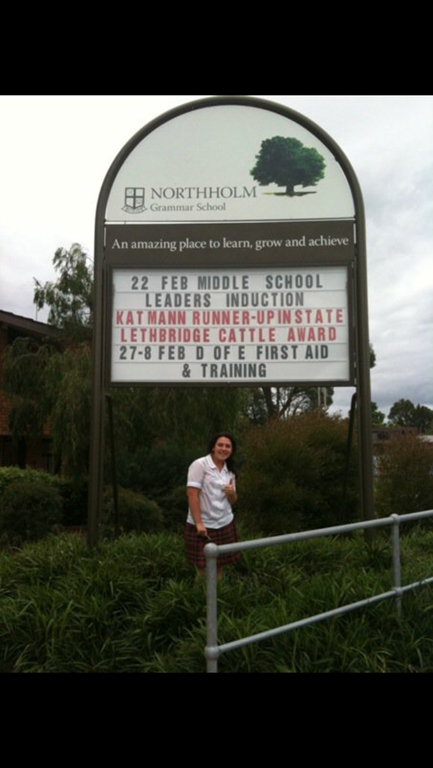 Growing up in Castle Hill, I attended Northholm Grammar School which was the first stepping stone into a somewhat whirlwind adventure. As soon as possible I immersed myself in all the agricultural possibilities the school could offer- the one with the biggest impact, still to this day, was the cattle show team. I loved the whole atmosphere surrounding showing cattle. There was an overwhelming sense of being involved in something bigger than just cattle showing, like knowing that we have the capability to change the future of an already strong industry and make it even better in the future. Knowing that I was one of the young Australians growing up and becoming involved in the agriculture industry at the same time as the big push to get more youth involved was great! I also loved seeing the entire paddock to plate process behind beef cattle. Along the way I would sometimes meet people who didn’t understand why I would raise a steer to ultimately slaughter and eat it, but for me knowing this was the cycle of life and was keen to respect the process and be well informed. Being involved in each stage of the process really allowed my passion for the industry to grow in many different directions. Showing with the school cattle team took me to various agricultural shows throughout NSW and provided me with the opportunity to network and represent other studs across a wide variety of breeds. Along the way I meet so many amazing, inspirational and wonderful people who shared my passion and enthusiasm for the industry. I am still in contact with many of the people I met through showing cattle today! I was fortunate enough to be nominated for the Angus Australia Norman Lethbridge Award which is named in memory of the NSW State Committee past Secretary (1983-1994) and well-known stock and station agent and open to 16-25 year olds throughout NSW. I was awarded runner-up within an amazing group; even though I didn’t win, the opportunity opened my eyes to how much I loved encouraging youth involvement within our school and the industry. In year 12 I undertook a prefect roll in Northholm’s leadership team with a particular focus on the agricultural portfolio and was awarded the Duncan Prize for Agriculture. After school I enrolled in a Bachelor of Natural Science (Agriculture) at the University of Western Sydney while also working as a farm hand. Farm working during my first year at university kept me very busy but I wouldn’t have changed a thing because I was able to connect with enthusiastic young people and coordinate the show team. However after 18 months I decided to move on to my next calling, working at the local CRT store whilst completing my second year at university. For two years I worked and studied simultaneously, gaining not only an enormous amount of knowledge and experience but also a massive sense of pride in seeing farmers and producers striving to create the best produce possible. In the final year of my degree I took on a sub-major in Animal Science at the same time as accepting the marketing position at that same CRT store. This meant that I was completing a year-long field project with Seed Distributors Ltd testing palatability of pasture species, completing another six full time subjects, working in agricultural sales at CRT as well as coordinating and creating all the store’s marketing material and field day attendances (including Agquip 2013). To say I was busy was an understatement but I still made sure I always had time to show cattle at local shows as well as the Sydney Royal Easter Show! I finished my degree at the end of 2013, as the only female in a ‘class’ of three people. It was then that I knew it was imperative for the youth of Australian agriculture to speak out, get active in the community, engage with other young people and get involved in the decision making processes in agriculture. At the CRT store my background and knowledge in show cattle allowed us to build up the product range on the shelf. As one of the youngest people on staff I became the ‘go to person’ in the shop for new young customers and anyone who came in asking anything about showing cattle. I was also able to connect our clients selling cattle with students I had met through school cattle shows who had expressed to me that they would like to start up their own cattle studs. It was great to see them developing and growing their studs! I still try and stay in contact with them as much as possible and this year I even visited one of the girls at Sydney Royal with her speckle parks! 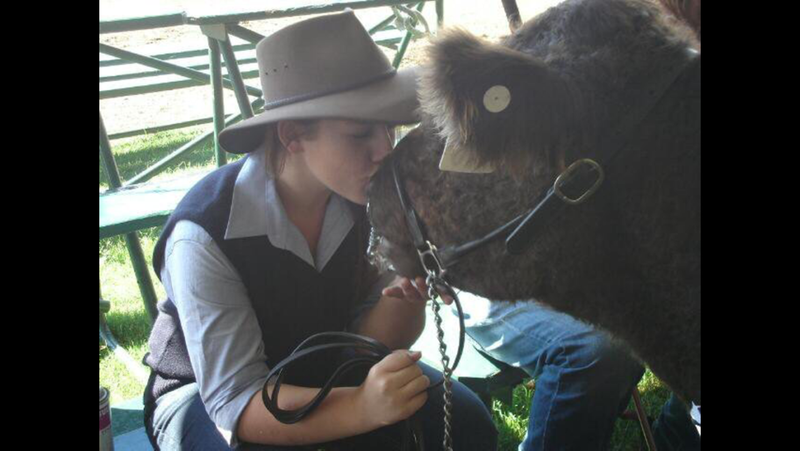 We also sponsored many local cattle shows including the Hawkesbury Small Breeds Show at the Farming Small Areas Expo, allowing that show event to go ahead for two years when it couldn’t have without sponsorship. Fast forward six months and I now live in Terramungamine, NSW, about 30km out of Dubbo. I always knew I wanted to experience working in agriculture in areas a bit more west than Sydney’s western suburbs, so when my partner – who I met working at CRT – was offered a managerial position at another rural supplies store in Dubbo, I jumped at the opportunity to go with him. At the moment I’m working in retail while still striving towards my dream career goals. It has been great to get to know the community in Terramungamine. It was difficult moving without really knowing anyone however I love it now and wouldn’t have it any other way! Waking up and looking out the bedroom window to paddocks as far as the eye can see and hearing the cows bellowing- there’s nothing like it! Even just living out here is a dream come true. It has cemented in my mind this is where I want to be and we now have many dreams for the future. 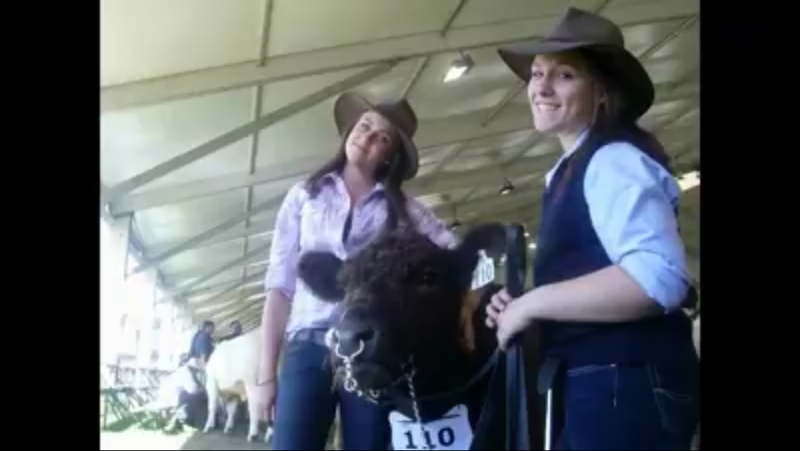 One thing that I would absolutely LOVE to do is to organise a steer show for the schools surrounding Dubbo, similar to the UniSchool Steer Show for the schools around the Hawkesbury. The UniSchool Steer Show was what really got me interested in agriculture and what made me fall in love with showing cattle. In my experience my entire school liked hearing about the steer show, so I believe it’s a great chance for kids from all backgrounds to get hands on experience with cattle and agriculture. This year I’ve put my hand up for the Showgirl event at the local show with an aim to open up the possibilities for young aspiring agricultural professionals to get involved and have their voices heard! I hope to take ideas from my local hometown show in Castle Hill, which has a large focus on schools from the area, and tailor them to the Dubbo region. It’s important to me that youth get involved with agriculture because they are the future of the industry. When I was at school there were a select few people who took the chance to show a 14 year old city girl the ropes and I intend to pass that encouragement on as much as I can. All it takes is one positive remark, congratulations or even a ‘better luck next time’ to someone who is starting out in the industry and it can make all the difference between them pursuing their goal or giving up! I always try my hardest to encourage and help people with their dreams and aspirations. Ultimately, I would love to start my own cattle stud in the future when I have some of my own land! But until then I have been living my dreams through my friends who have set up their own studs. I try and get involved with the shows as much as possible- if I’m not there helping out with the cattle then I love watching the judging. I encourage all young people with a story and a passion to speak up and share their experiences in the hope of inspiring a whole new generation of agvocates, because with them the future will be bright. Previous Previous post: Take the plunge into Agriculture says Kate McDonald, it’s worth it!